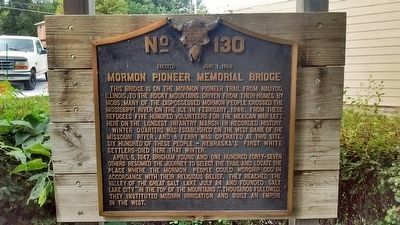 Mormon Pioneer Memorial Bridge. —. This Bridge is on the Mormon Pioneer Trail from Nauvoo, Illinois, to the Rocky Mountains. Driven from their homes by mobs, many of the dispossessed Mormon people crossed the Mississippi River on the ice in February, 1846. From these refugees five hundred volunteers for the Mexican War left here on the longest infantry march in recorded history. Winter Quarters was established on the west bank of the Missouri River, and a ferry was operated at this site. Six hundred of these people - Nebraska's first white settlers - died here that winter. This Bridge is on the Mormon Pioneer Trail from Nauvoo, Illinois, to the Rocky Mountains. Driven from their homes by mobs, many of the dispossessed Mormon people crossed the Mississippi River on the ice in February, 1846. From these refugees five hundred volunteers for the Mexican War left here on the longest infantry march in recorded history. April 5, 1847, Brigham Young and one hundred forty-seven others resumed the journey to select the trail and locate the place where the Mormon people could worship God in accordance with their religious belief. They reached the valley of the Great Salt Lake July 24 and founded Salt Lake City "in the top of the mountains." Thousands followed. They instituted modern irrigation and built and empire in the West. marker is included in the Mormon Pioneer Trail marker series. Location. 41° 20.238′ N, 95° 57.65′ W. Marker is in Florence, Nebraska, in Douglas County. Marker is at the intersection of 30th Street and Willit Street, on the left when traveling north on 30th Street. Touch for map. Marker located in park adjacent to The Bank of Florence. Marker is in this post office area: Omaha NE 68112, United States of America. Touch for directions. Other nearby markers. At least 8 other markers are within walking distance of this marker. The Bank of Florence (here, next to this marker); From Indian Lands to the Golden Gate (within shouting distance of this marker); A Little Town That Dreamed of Greatness (within shouting distance of this marker); Winter Quarters (about 600 feet away, measured in a direct line); The Mormon Pioneer Trail (approx. 0.4 miles away); A Meeting House for the Saints (approx. 0.4 miles away); The Florence Mill (approx. 0.4 miles away); a different marker also named The Florence Mill (approx. 0.4 miles away). Touch for a list and map of all markers in Florence. More. Search the internet for Mormon Pioneer Memorial Bridge. Credits. This page was last revised on June 16, 2016. This page originally submitted on November 10, 2015, by Tom Bosse of Jefferson City, Tennessee. This page has been viewed 287 times since then and 16 times this year. Photos: 1, 2. submitted on November 10, 2015, by Tom Bosse of Jefferson City, Tennessee. • Bill Pfingsten was the editor who published this page.